I hope you all have had a wonderful Christmas! 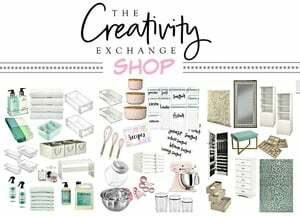 If you’re in the process of packing up Christmas, I wanted to pop in today and share some creative Christmas storage ideas and products to help you organize your Christmas and holiday decor. Every year, when it’s time to pack up Christmas, I use this time as an opportunity to better organize and think about ways I could store stuff that would make it easier to unpack/utilize next Christmas. I also like to get creative and maximize every square inch because unfortunately, I do not have a lot of storage space in my attic. So today, I wanted to share some of these ideas and products that have really helped me. 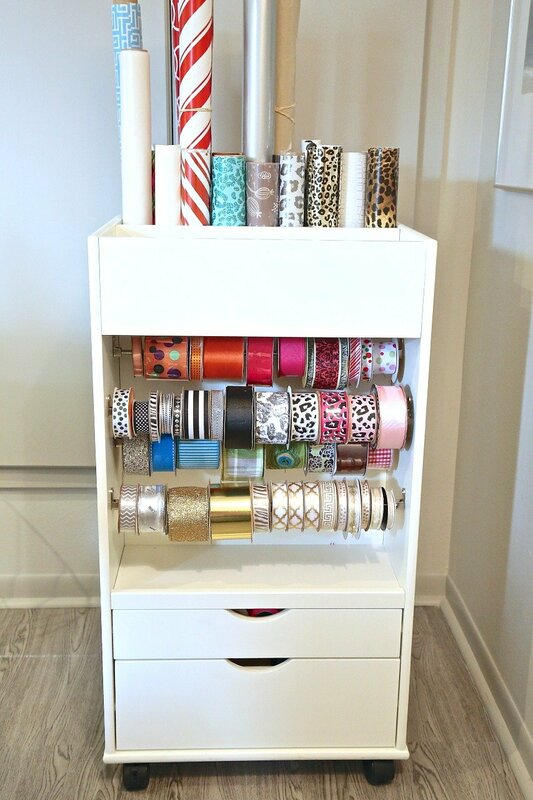 One of the best things I ever did after Christmas two years ago was to buy this awesome gift wrap station that is on wheels. This gift wrap cart takes up very little room but I was shocked at how much it holds! 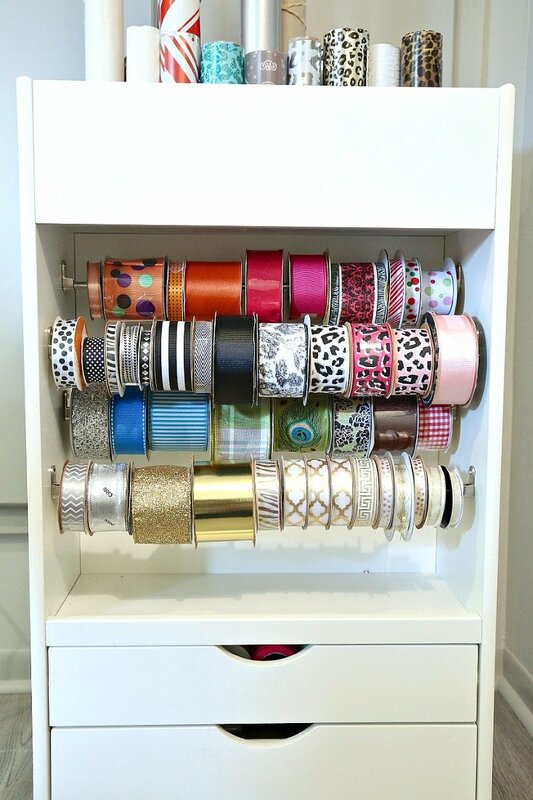 Because it holds so much, I was able to combine my everyday wrap/ribbon along with all the Christmas wrap/ribbon. Some Christmas wrap like the solid white, brown craft and ribbon can actually be used throughout the year, so it made sense to me just to combine everything because it will hold it all. 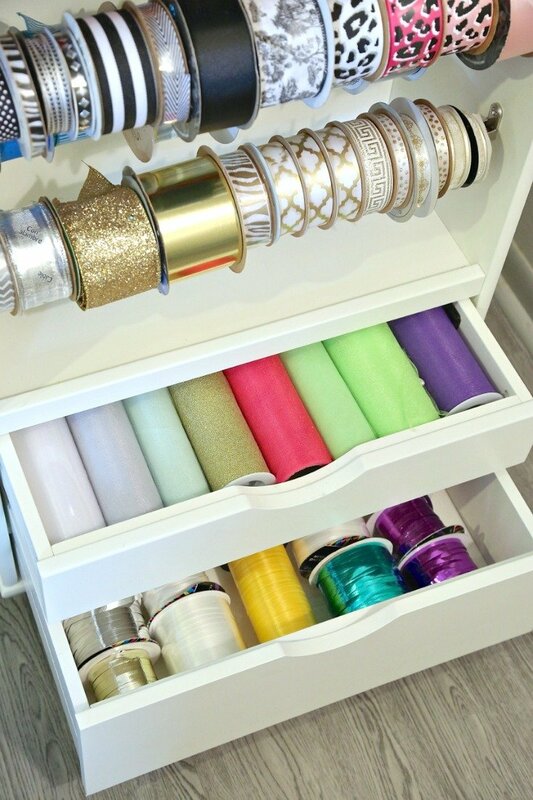 So on my cart, you can see that it holds about 45 spools of ribbon (on the 4 rods), over 25 rolls of gift wrap tubes and there is tons of extra storage in the drawers and up top for gift tags and other wrapping supplies. I keep this cart just inside my attic drawer and roll it out as I need it throughout the year. It has been a life saver! Plus, it’s so convenient at Christmas because I don’t have to unpack anything, I just roll it out! Another great piece that a bought a few years ago is this inexpensive 12 drawer storage cart that has also been a life saver. I actually ended up buying 3 of them for different purposes around my home. However, the one I use for storing Christmas, I store decor like floral sprigs, Christmas candles, Christmas linens, tree/garland ribbon, Christmas kitchen serving pieces and all that Christmas little stuff. Again, this piece takes up very little room in storage and at Christmas time, I just roll it out and work out of it as I decorate. Because I don’t use everything, I can still see what I have without unpacking it. When it’s time to pack up, it’s so easy just to slip things back into the drawers. 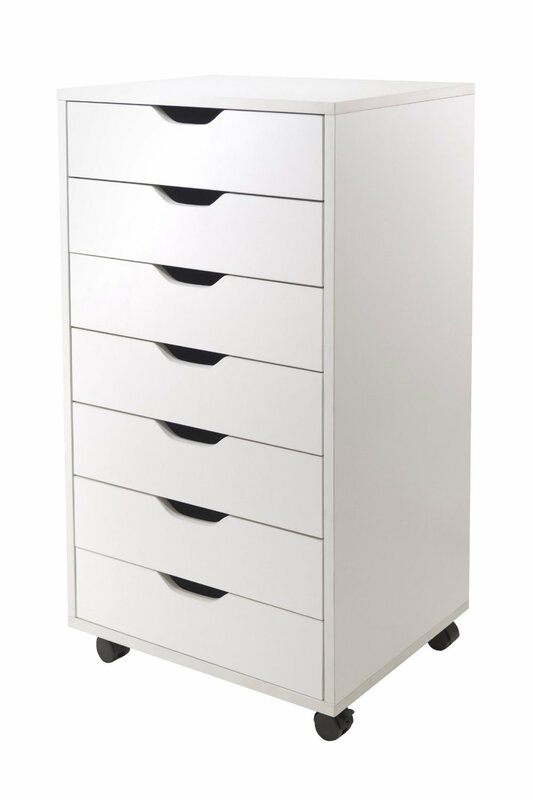 Another storage cart that I love that could be used for Christmas is this 7 drawer storage cart. I use it for non Christmas stuff but it would work beautiful for storing all types of holiday decor. 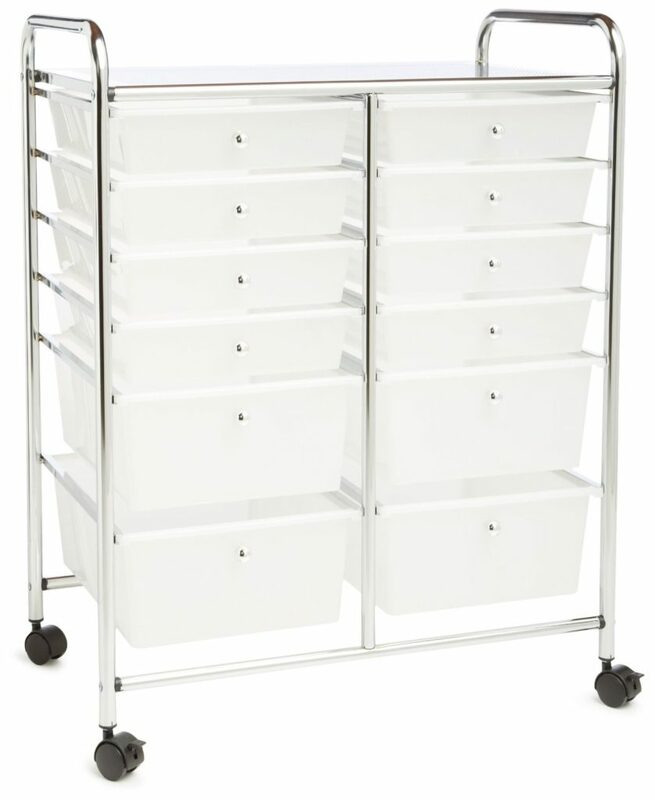 Have you figured it out yet that I have a thing with rolling storage carts? 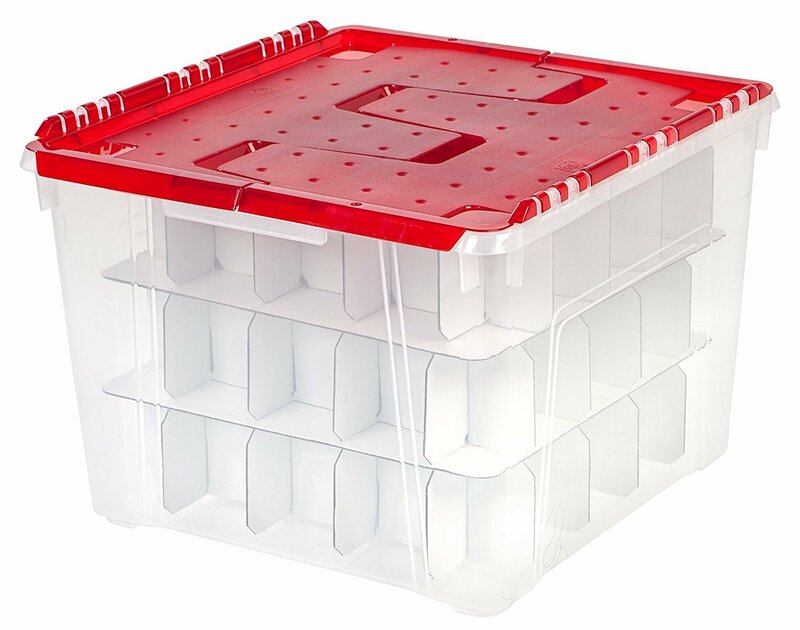 If you think about it, these carts are more compact than stacks of plastic storage tubs and you can work out of them when it’s time to decorate. Also, they look nice. 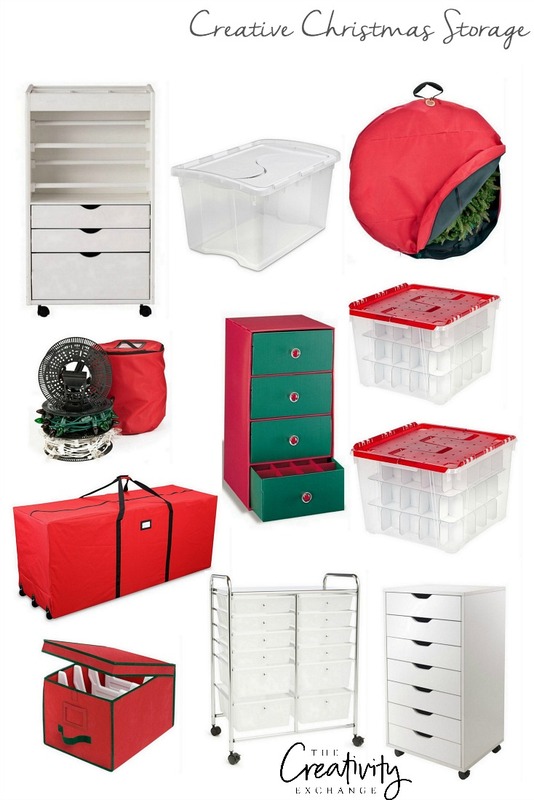 So if your Christmas storage is in a closet, it’s a cohesive and smart way to store Christmas. For all of our other ornaments, we found and use these plastic winged storage tub with cardboard ornament dividers that holds 75 ornaments. Over the years, we have tried several different storage tubs for ornaments but we like this one the best and now only use these. They stack perfectly and there are not many tubs that hold 75 ornaments. Plus, it’s not as wide/big as the others, so it’s easier to carry and it takes up less room in storage, There is also enough room to wrap the more fragile ornaments in bubble wrap. I also get really creative with these canvas wreath heavy duty storage bags that have a handle on them for hanging either from a ceiling or wall of your storage area. While I use them for storing wreaths, I also use them for storing other non breakable Christmas decor because I can hang them from the attic ceiling and make use of that wasted space. By the way, if you have any of those big plastic wreath storage holders, they are also great for storing ornaments and they hold a ton. 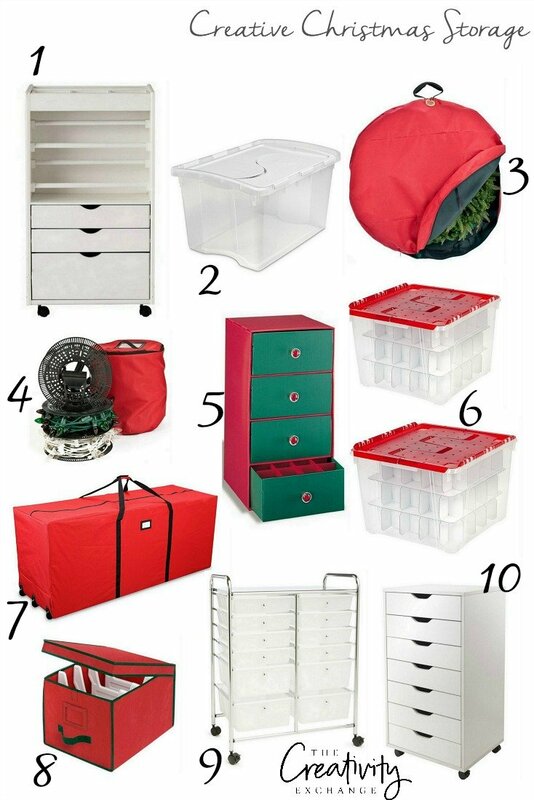 For storing Christmas lights, we use these storage pieces because they are compact but keep the lights organized. 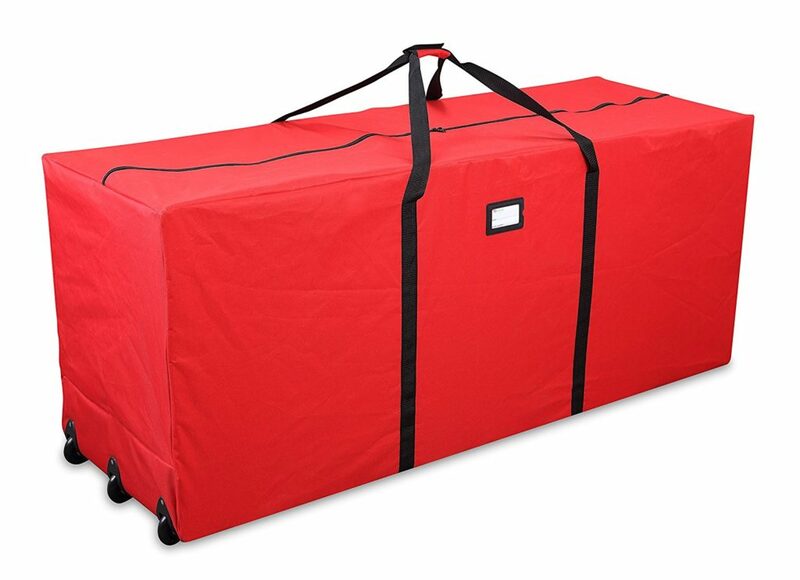 For our artificial tree, we use this large rolling heavy duty storage bag with wheels. 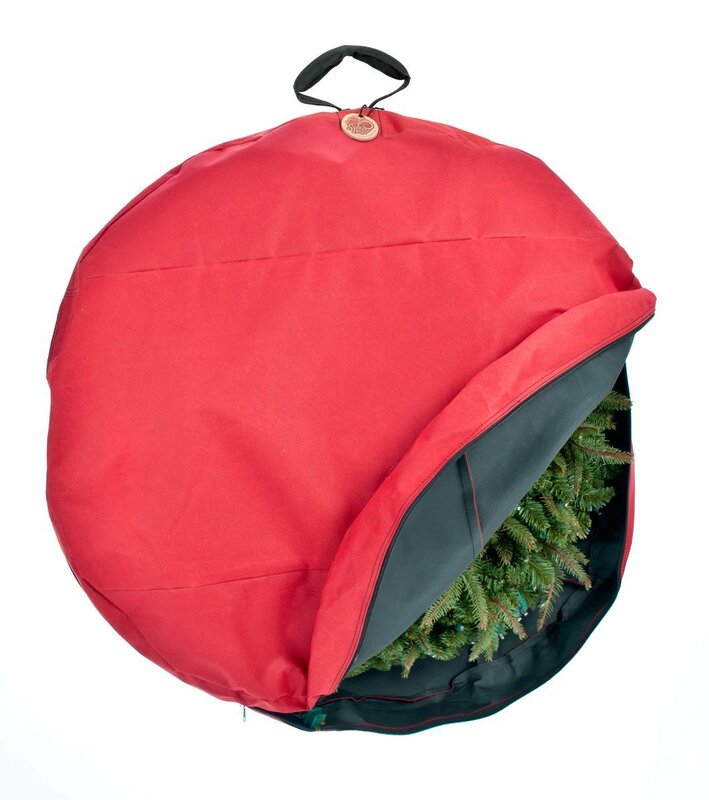 We like it because it’s so easy to store (we store it upright) and it’s so convenient to pull out with the wheels to where we set up our tree. These are all the rest of the storage pieces that we use and love. 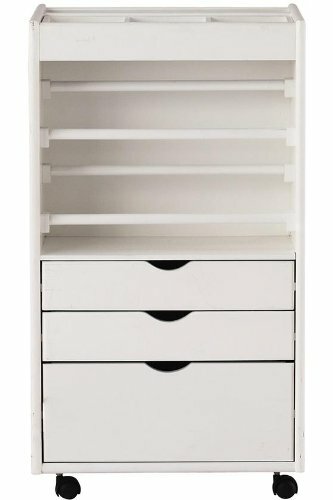 All of them have really helped us to maximize every square inch of storage with great functionality! 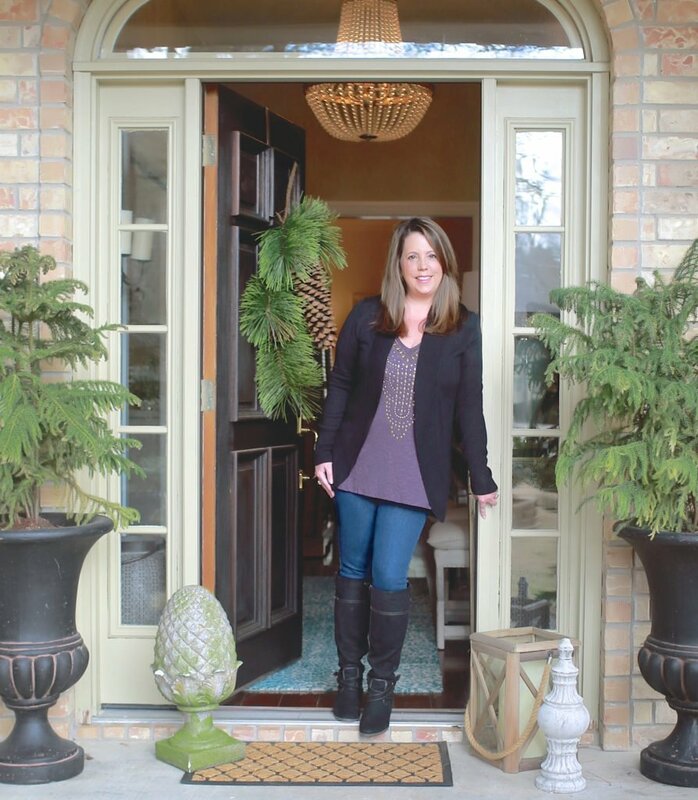 Thanks for stopping by today friends and if you missed Christy’s post yesterday with a round up of creative New Years Eve cocktails and decor ideas, you can find that here.